An empty cage is no fun for this guy. 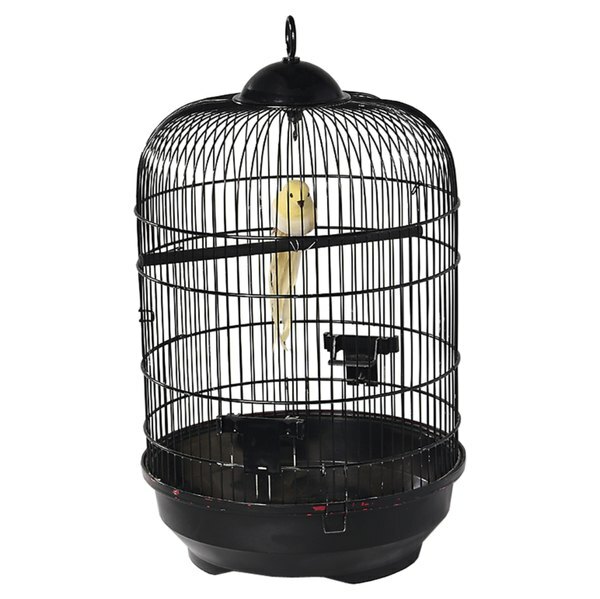 Keep your parakeet happy and entertained with a well-stocked cage. There will be no stopping this active birdie from hopping around, amusing himself and socializing with his friends. Rotate and alternate the items to keep him guessing. First things first: you have to provide food and water, of course! Covered dishes will keep food and water fresher and cleaner. Another tidy option is a water bottle. A water dish is easier for your bird to use earlier on, but she can get accustomed to using a water bottle over time. (Be patient with the transition, leaving a water dish in the cage until she's figured out the bottle.) Whichever one you use, keep the water fresh for your birdie. Have a cuttlebone hanging from the cage at all times. This is basically a birdie chew toy that keeps the beak trim. Cuttlebone is also a source of calcium for your little friend. Mineral blocks and lava stones work too. The simplest bedding option is used newspaper laid down on the bottom of the cage. You can also choose any of a number of commercially available pet litters made of recycled newspaper shreds or wood shavings. Stay away from cedar or pine shavings, however, as they can make your birdie sick. Your winged buddy will love to bathe and splash around in a birdbath. Use a regular kitchen bowl for this or invest in a birdbath from the pet store. He won’t care either way, as long as he gets to play around in it. Keep your parakeet occupied with something fun to play with. Mirrors and bells offer a source of amusement. A trip to the pet store will offer you a wide variety of goodies to choose from: try different kinds to find out what your bird prefers, and switch them up from time to time for novelty. You don't have to be told your parakeet is an active creature. Give her a way to work off excess energy by arranging swings and perches throughout the cage. You can buy (or make) perches and swings of different materials, in different sizes, for variety. A thick hemp rope will also offer some swinging fun. No fewer than two or three hanging devices should be placed in the cage so she can hop around.